"This is a popular meat dish from Southern Norway. Lamb and cabbage are layered and stewed with peppercorns. Serve with boiled potatoes that have been sprinkled with parsley." 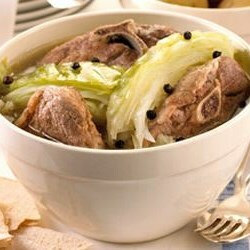 Arrange a layer of sliced lamb in the bottom of a Dutch oven or soup pot. Top with a layer of cabbage. Repeat layering as many times as you can. Tie the peppercorns into a small piece of cheesecloth, and place them in the center of the casserole. Pour the water over all, and cover with a lid. Bring to a boil, then simmer over low heat for 2 hours. Remove the package of peppercorns before serving. Fabulous! I really enjoyed this--it was very easy to make. (I may be biased since I grew up eating Norwegian food) Either way, thanks for posting!